Congratulations to Sam Stein; Winner of Event #31: $3,000 Pot-Limit Omaha ($420,802)! Not too long ago it seemed that the expected final day of Event #31: $3,000 Pot-Limit Omaha would be extended to a day four, but after a quick succession of eliminations, a winner has finally been declared with Sam Stein proving victorious as the clock ticks past 5:00 a.m.
With the sun rising here in Las Vegas, a look back on Event 31 saw some of the most talented Pot-Limit Omaha players form a field of 685. From past bracelet winners to world champions, the field was totally stacked, but after an action-packed day one, only 138 players remained with Ben Lamb sitting atop of the field alongside poker professionals and tournament veterans. 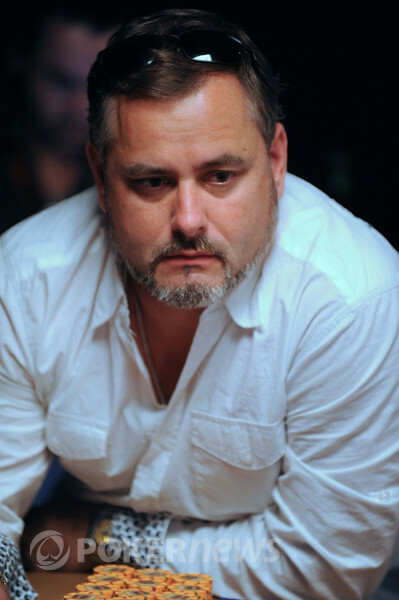 Yesterday saw the field expecting to play down to a final table, but we would shy with just 25 players still fighting it out as Dan Heimillier (63rd), Bryn Kenney (59th), Brian Roberts (53rd), Joe Hachem (50th), Tony Cousineau (49th), Eli Elezra (41st), Jeffrey Lisandro (35th) and Gabe Patgorski (31st) all falling short of a final day berth. Eliminations flew fast once we started play today as Tommy Le (20th), Rami Boukai (17th), Andrew Chen (13th) and Tex Barch (10th) were just a select few that fell before a final table of nine was formed with day one chip leader Ben Lamb leading the final table with nearly one-third of the chips in play. It would take nearly 90-minutes until we lost our first player, and once Dilyan Kovachev hit the rail, Austin Scott followed soon after before Brock Parker's chase for a third bracelet would end in seventh. A short-stacked Zimnan Ziyard exited in sixth before chips swirled round for several hours before Adam Junglen couldn't capitalize on his second WSOP final table as he exited in fifth. Although possessing the loudest rail, Christian Harder would be next out the door as Warren Fund left Lamb and Sam Stein heads-up with just a half hour remaining on the clock for the night. With Stein holding a better than two-to-one advantage over Lamb, it would take a few dozen hands before Stein's turned Broadway straight hold against Lamb's second-nut straight and re-draw to a chop to see Stein awarded the Event #31 Champion and recipient of a gold bracelet and $420,802 first prize. Throughout the tournament, Stein displayed great bouts of aggression, timeliness and reading abilities to navigate his way through one of the most highly talented Pot-Limit Omaha fields ever assembled. PokerNews would like to congratulate Sam Stein on a excellently played tournament as his lifetime winnings now close in on 3 million while also adding a gold bracelet to his trophy cabinet. For the PokerNews Live Reporting Team, we will be back on the floor tomorrow reporting on all the live action from the 2011 World Series of Poker and the Rio All-Suite Hotel & Casino! Ben Lamb Eliminated in 2nd Place ($259,918); Sam Stein Wins! Sam Stein opened his button to 120,000 and Ben Lamb made the call to see a flop fall. 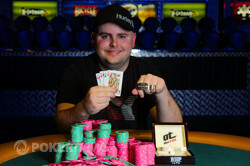 Lamb pushed out a bet of 150,000 which was swiftly called by Stein as the landed on the turn. Lamb fired once more - this time for 255,000 - and after nearly two minutes in the tank, Stein announced a pot-raise. A seemingly stunned Lamb paused for a few moments before pushing roughly his last 900,000 into the pot as Stein announced a call. With Lamb needing an ace for a chop, Stein immediately turned to his rail and stated, "No ace and I win!" There would be no night-continuing river when the dealer dropped the on the river to ensure Stein the bracelet as Lamb collected $259,918 for a gallant second place. Sam Stein opened for 140,000 and Lamb called. The flop came and Lamb led out with 155,000 and Stein called. The turn came , Lamb checked and Stein bet 370,000. Lamb folded and Stein took the pot. Ben Lamb raised to 120,000 on the button and Sam Stein called. The flop came , Stein checked and Lamb bet 145,000. Stein called and the turn came . Stein checked again and Lamb potted to 530,000. Stein folded and Lamb took the pot. 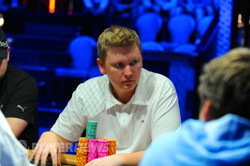 Ben Lamb opened to 125,000 from the button and Sam Stein potted from the big blind to 375,000. Lamb folded and Stein flashed his . Sam Stein opened to 120,000 from the button and Ben Lamb defended his big blind. The board of was checked down to see Stein table his to collect the pot. So far in this heads-up battle things have been fairly slow. Both players have won their fair share of the pots, and with roughly 20 minutes remaining in the day, it seems as though the players are playing fast enough to try and get result before play ends for the night. Sam Stein and Ben Lamb have returned to the table and the cards are now in the air!